We all woke up this morning in the hospital. Gabby got sick again and complained her head hurt. The pharmacy screwed up the prescriptions so that put going home out even longer. When we did finally leave we needed to find a gas station. Before Gabby was diagnosed I used to walk to the Sunoco down the street and get her a Gatorade and a candy bar. Today we pulled into a Sunoco for gas and she wanted to get out to get a drink and candy! She can’t walk by herself so Carolynn and I held her as she walked in. She grabbed three different things. We got them even knowing she most likely couldn’t chew or swallow them. The mass is on a part of the brain that effects swallowing. She pockets food and usually Carolynn or I have to pull it out of her mouth. As we walked her into the store, I realized this wasn’t over, this was how life now is for Gabby. She can’t just run into the store and grab what she wants. We hold her up as she tries to control her legs to go in the right direction. When we pulled in our neighborhood, the first thing we saw were pink balloons everywhere. 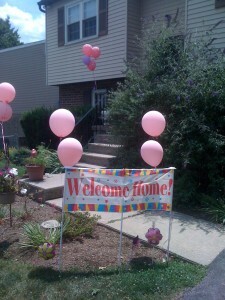 The neighbors tied balloons to each of the mailboxes on our way into our neighborhood. When we pulled into our driveway there were even more balloons, paintings in sidewalk chalk everywhere, a huge welcome home sign, and other signs on the door, garage door, and my truck. I teared up, Carolynn started crying before she even got out of the car. I slowly walked Gabby inside. 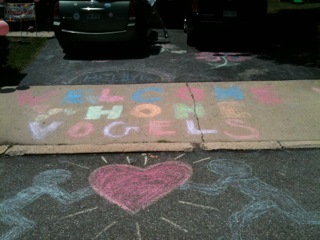 The neighbors did such a great job making us all feel special coming home. 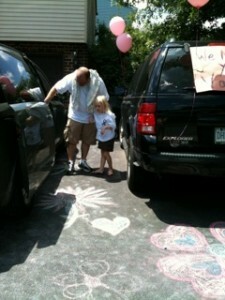 We let everyone know Gabby wasn’t feeling well so we didn’t want a lot of people there to welcome us. They understood. We truly have amazing neighbors, I wish I would have told them that before this happened. I want to thank not only our neighbors but every single one of you who have sent gifts, donations, or prayed for us. We love you all very very much. We couldn’t have and will not be able to continue without the help of family, friends, and the Gabby’s Angels group! We consider you family! Thank you, Thank you, Thank you. I’m sure you have heard in prior posts that the first thing Gabby wanted to do when she got home was pet her dog. Today she got to pet her dog Posey! Gabby came in the house and saw a stack of presents sitting on the floor. She immediately sat down to open them. She opened a lot of gifts and then laid down with her dog. Her sisters helped her open the presents and were extremely gentle with her, helping her with anything she needed. 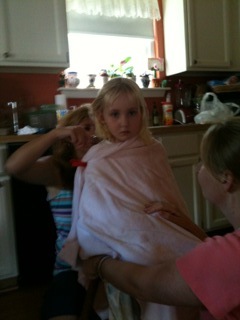 Our neighbor came up to cut her hair. We were told most of it would probably fall out this week. With it shorter hopefully it won’t be as traumatic for her. As I sat there and watched Gabby’s long hair being cut I had to leave and hide in my bedroom twice. When your baby gets her first haircut it’s a big deal, a proud moment. You scoop up a lock of hair and save it for memories. This wasn’t one of those times. I realize that what’s growing in her head is the enemy and hair loss isn’t something we should be worried about. It was just another reason to be angry. Why her, how is this possible. She has always had long hair. And next week she won’t and we will see something that makes this even more real. Gabby has been watching more TV in the hospital over the last week. She has seen many Build a Bear commercials and really wanted a special bear when we left the hospital. We had talked about going some time after she got out of the hospital. I don’t know that we were prepared to go today. Still not sure if it was a good idea, but Gabby basically crawled towards the door and was going to Build a Bear with or without us. So we went. She pointed at things and we said” YES”. I think she has a free pass that makes the word NO impossible right now. We stopped for frozen yogurt and headed home for the second time today. Isn’t home supposed to feel good? So here I sit, Gabby is asleep across the room from me. Her sisters and Carolynn are outside at the neighbors. I’m looking at the Build a Bear stuff we got today. It’s just stuff. It doesn’t solve anything. I can feel the anger inside me building. The kids are laughing outside and Gabby can’t walk. They are getting ready to watch fireworks tomorrow and my daughter can’t handle eating anything other than mushy Mini wheat’s all day. I realize I said all this before, and I may sound like a broken record, but I thought going home would be different. I thought we would all feel good. Carolynn has cried throughout the day. I have just remained silent. I put a walker together and hated the site of it. Thought about kindergarten and whether she would be able to go now that she is wearing diapers again. Is she going to manage to go at all? I saw a message from someone today, who thought everything was okay now. They thought she is fine. I got angry, did this person really not have a clue? I wish her being okay was the case, but the truth is this isn’t a broken bone, she wasn’t in a car crash, this is something that is going to go on for a long time. If I can’t manage, how can I expect her to. A pair of her glittery sandals have been sitting on our porch for well over two months now. I never moved them, don’t know why, When we went to the hospital on Memorial Day we stopped at McDonald’s. I haven’t taken the happy meal box and toy out of the car yet. I can’t explain it I just won’t take it out. I don’t want to change or move anything from when she was normal healthy Gabby. Her supporters come up and say they can’t possibly understand what we are going through. And they are right! I wouldn’t want them to, it’s horrible. Even our own family can’t truly understand what it means when a child that is made from part of you is given a diagnosis like this. I pray that none of you ever have to. 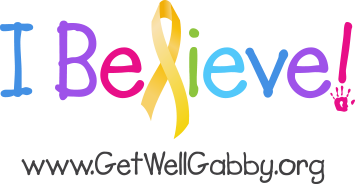 And to all our friends that we have made in the last month whose children are suffering the same way Gabby is, I’m sorry you do understand and are going through the same thing. I sit here, numb. I’m sure most people would say be happy with what you have. These are the people who most likely aren’t happy with what they have, They probably want a bigger house, faster car, and a better job. Don’t get me wrong, I was that way. Now I could care less about my house, car, or job. I just want Gabby outside playing with her sisters. I don’t want her sleeping on the couch in front of me with her eyes slightly open. I talked yesterday about the first time I brought our first daughter home. I said it was so quiet yet so loud. I can’t even describe the feeling now. The quiet is terrifying. But I can’t tell that to my daughters and neither can Carolynn. We have to keep acting like everything is okay. Even though tonight at ten oclock Gabby will get three different types of medication. 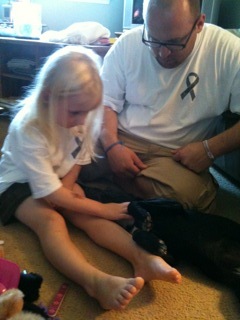 Tomorrow at 6:00am another medication, and lets not forget the Chemo we give her at 6:30. Acceptance is what I’m guessing people say should come next. Don’t see that being possible, just when I thought I was getting there I realized I don’t want to accept anything. I just want everything to be okay. So I’m angry, I’m numb, and tingling. I want to scream and throw things at the wall. I want a drink, I want to forget, I just want to be like all the other people out there not going through something like this. But more importantly this is about Gabby. I want her to be like all the other little 5 year old girls out there getting ready to watch fireworks in the next few days. I wish I had a list of funny things to post, I don’t. Gabby is home and doesn’t have to go back to the hospital till Tuesday. Tomorrow is another day. Good, bad, or otherwise, we are going to be just as scared tomorrow as we were today. All I can say is I only have a glimmer of what your going through and my heart breaks for you and I pray for God to give you and each member of your family love and strength to carry on and I pray especially for Gabby. I just finished cancer treatment in March and I am a single parent whose ex pays nothing for the care of our child. I did work during treatment but would have had a tough time making it without the wonderful benefit held in my town for me! It was not easy but so much easier than what you are going through!!! Lean as much as you can on all those around you who are offering help. When you realize what you need tell them when they ask, they want to do more, just don’t know what. In order to give Gabby and your other daughters what they need and make it through yourself, you need to rely on more than each other, you both need to lean on those around you and let them lift you up with their kind word and deeds!!! This advice was given to me early on by a friend who had already been through it. It was wonderful advice and made a HUGE difference in my daughter and I’s ability to get through the 15 months of treatment! Take one day, one hour, one moment at a time and just concentrate on that small amount that you can manage!!! My heart goes out to you and I will continue to pray for all of you!!! What a moving update. I think of your family daily. I wish you strength. I think your family is dealing with this with such grace. Please know you are in my thoughts. I imagine being able to express your thoughts and fears through writing is helpful. I honestly can’t think of anything appropriate to say other than we are thinking of you. You write so eloquently — I hope it’s somewhat therapeutic for you to put your thoughts into words like this. I’m so sorry you are going through this. Of course you’re angry and terrified; I would be too. I’m very moved by the community support you’re receiving — it seems that all of Phoenixville is pulling for Gabby. May God hold you and yours in the palm of His hand. God bless you, and your family. You are in my prayers. I believe that God really knew what he was doing by putting such a precious angel as Gabby and your other two beautiful daughters in your life. You are a most amazing man and father, your complete and utter love for your family shines through every word you write. Gabby couldn’t be in better hands than with her Heavenly and Earthly fathers. I am so sorry. My youngest son, Caleb, was diagnosed with congenital heart disease before he was even born. My husband and I were going to CHOP for ultrasounds and echocardiograms before he was born. I delivered him at the Special Delivery Unit at CHOP, and at three days old he had open heart surgery. He started healing well and was suppose to come home about a week after his surgery. However, he started having complications the day he was scheduled to come home. The following three weeks were a blur of emotions. They had to drain all the excess fluid off his lungs which caused him to loose almost 2 pounds ( born 7 lbs 11 oz- and then weighed 6 lbs 3 oz). They had trouble getting him off the breathing machine, and kept intubating him and extubating him. Finally, they were able to get him under control, and he was able to finally eat (through a feeding tube). We finally were able to bring him home after 34 days (those days spent traveling back and forth from York County to CHOP-due to my oldest needing me as well). I can relate to your fear of bringing Gabby home. We had all of these special instructions: medications (all at different times- my phone is used as my alarm clock and calendar for all of his medication times and appt times), how to take care of him due to being after surgery, how to take care of his scar, and the fearful- the signs for congestive heart failure. Every time he coughs (one of the symptoms of congestive heart failure) or seems slightly different I get sooo worried. I can slightly relate to the feelings of the world stopping while everyone else is living their life, the cycle of emotions (I still experience it), constant worry, and not happy with people who say that “everything will be ok”. They don’t comprehend the situation. We were told that he is going to have a second surgery (we just don’t know when yet- he needs to get better and gain weight) which just adds to the stress and worry. I know our situations are different, but our feelings are similar. I will be praying for you and your family. I will also be praying for Gabby. The main person who got me through everything with my youngest son, Caleb, is the Lord. Please continue to keep me updated on Gabby.